Hello everyone, and welcome to another Singaporean review! This Sunday, I’m reviewing the T-Diver from Trigalux. The Trigalux T-Diver, priced at 190 Euros/~$299 SGD (after promo code below). The Trigalux T-Diver is described as a affordable military styled diver, with strong emphasis on lume. Let’s see how the T-Diver fares! Trigalux is a relatively new microbrand that hails from Spain. The brand is founded by Angelo, who has over 20 years of experience in reluming watches! For those who have been following the microbrand diver scene for some time now, Angelo was also the founder of now defunct brand Luxmento. The Trigalux T-Diver, in an alternative orange colourway and on a rubber strap. To me, the most interesting fact about Trigalux is in its in-house assembly process. At this price point, most microbrands outsource the assembly process to Chinese OEM factories in a bid to keep cost down. In contrast, Angelo hand-lumes each watch, either with Swiss C3 luminova or their proprietary X5 lume. Yes, you heard me right – Trigalux develops their own lume! To my knowledge, I’m not aware of another microbrand that does that. Lume seems to be Trigalux’s calling card (in fact, in addition to their watches Trigalux also sells lume and offer reluming services on their webpage), and they continue to focus on their strength in the watches they offer. At under $300 SGD (excluding VAT, and after the promo code below), I’ll say that the Trigalux T-Diver probably has one of the best build quality in its price segment. Sapphire crystal (with AR coating) is used, with 200M WR rating. Firstly, the T-Diver utilizes sapphire crystal to protect the watch face. As aforementioned numerous times in my previous reviews, I’m a huge advocate of sapphire crystal due to their inherent scratch-resisting properties. Personally, I always look for sapphire crystal in my modern watches as it adds greatly to the durability of the watch. There’s also an AR coating applied here, prevents potential nasty reflections from occurring. The WR rating for the diver is 200M, which is adequate for swimming in the pool and bringing it out to the beach, though I probably would not recommend deep diving with this on. The ubiquitous Seiko NH35A powers the T-Diver. Powering the T-Diver is the workhorse Seiko NH35 movement. The Seiko NH35 movement is a common sight in microbrand watches at this price bracket due to its reliability and affordability, and is a movement I’ve covered numerous times on this website. Some quick specs: the movement beats at 21600 vibrations per hour, has 42 hours of power reserve, contains 24 jewels, and is hacking. I’m a fan of the Seiko NH35 movement, much more than the Miyota 8 series movement (which is the alternative movement commonly seen at this price point). This is due to the fact that unlike the NH35, the Miyota 8 series movements are non-hacking, suffer from a stuttering second hand (some models), and in my own experience with the Miyota movements, are also more prone to accuracy problems. No complains here! You get a choice of either a rubber strap, or a khaki NATO strap. With the T-Diver, one chooses between having either a rubber strap or a khaki NATO strap (pictured above). I chose the khaki NATO strap as I felt it complemented the military feel of the watch better. I especially liked the fact that the strap loops of the NATO strap is bead-blasted finished in the same fashion as the case is. I appreciate the attention to detail present here! I think it looks beautiful on a leather strap. Image Credits: Pinterest. That being said, I think the T-Diver looks absolutely gorgeous on a leather strap. Personally, I’m more of a desk diver, so I wear my dive watches on a leather strap because I think they look amazing. Unfortunately, Trigalux does not offer leather straps for the T-Diver on their web-store, That being said, good quality leather straps can be bought from webstores such as Nomad Watch Works for cheap – it’s an affordable way to dress the watch up! Look at that gleaming watch face – courtesy of Trigalux’s proprietary X5 lume. The T-Diver I was sent boasts Trigalux’s proprietary X5 lume, which Angelo hand applied himself! The regular version of the T-Diver comes befitted with Swiss C3 Superluminova, but customers have an option to upgrade to Trigalux’s in-house X5 lume for a ~35 Euros (after promo code) premium. Given that lume is literally what Angelo does for a living, I already had high expectations, but I have to say I’m very impressed with the strength of the lume on the T-Diver. In fact, I’ll say that the T-Diver possesses the strongest lume out of all the watches I’ve reviewed thus far! For the lume-heads out there, the X5 lume on the T-Diver is really something to behold. Overall, I’m really impressed by the build quality of the T-Diver. At just under $300 SGD (after promo code below for the C3 variant, excluding VAT), I think the specifications are fantastic. It certainly lives up to its billing as a tool watch! I quite like the retro styling of the Trigalux T-Diver. The teal dial is unique. The T-Diver comes in a variety of dial colours (including orange), but I find the teal dial most interesting. It is certainly a rare dial colour, and looks striking to the eye. Apart from the dial colour, I find the indices unique as well. The paired angular indices really lends presence to the dial, and again makes the dial vie for your attention. I find the green accents of the otherwise grey minute track smart as well – there’s some contrast in colours, but the character of teal is still present. Elsewhere, I appreciate the red-tipped second hand, which injects a pop of bright colour into the dial. It also adds a tinge of sportiness to the T-Diver, preventing it from becoming too dull and serious. Overall, I think the dial of the T-Diver is well conceived and smartly executed, and it is certainly one that grows on you. The case and bezel is gunmetal finished. The 316L stainless steel case of the T-Diver is beadblasted, tempered in the oven and thereafter slightly buffed by hand, eventually resulting in a gunmetal finishing. The gunmetal finishing gives the watch a utilitarian feel, in conjunction with the watch’s military design. The cushion shaped case further heightens the vintage styling of the watch. It’s hard to make a cushion shaped diver that doesn’t look like a Panerai homage – I’m pleased to report that Trigalux has avoided that pitfall here! In addition, the etching on the bezel looks precise and detailed, and is really quite impressive. Unfortunately, the actual bezel itself is undersized, and feels rather stiff. Add both elements together, and you get a bezel that’s hard to rotate. This, coupled with a WR rating of 200M, makes the T-Diver much more suited for the desk than the deep ocean in my opinion. Gunmetal finished case sides, signed crown. The entire case of the T-Diver is gunmetal finished, meaning that one doesn’t see any contrast in finishing as one might see on other dive watches. However, I actually think that this is a smart move on Trigalux’s part. As they advertise the T-Diver as a “military styled diver”, the gunmetal finishing is acceptable, and perhaps even augments the military feel of the watch. Yet, the lack of contrast in finishing allows Trigalux to bring the cost down, ensuring that the T-Diver has a very affordable price-tag. Also, we get a basic signed crown, which is a nice touch as not all watches in this price range features signed crowns. Nothing much of note here. The screwed-down caseback is rather pedestrian, with the “T” logo of Trigalux etched on simply. There’s also some relevant information visible, advertising the fact that the watch utilizes sapphire crystal, houses an automatic movement, has a 200M WR rating, and is made out of all stainless steel. Overall, an unoffensive (if uninspiring) caseback – though personally, I find that the sparse nature of the caseback reinforces the utilitarian feel of the watch. All in all, while the design of the Trigalux T-Diver isn’t exactly the most eye-catching (nor should it be, as a military styled watch), the design is well thought-out. With the exception of the bezel, the T-Diver definitely does not look, nor feel, like a sub $300 SGD watch! That being said, I need to reiterate that I personally still believe that the T-Diver looks best on a leather strap – so if you’re thinking of getting one for yourself, I’ll advise you to get yourself a 22mm leather strap as well! Ask any WIS what they think the best diver under $300 SGD is, and chances are the venerable Seiko SKX007 will be their answer. In terms of build quality, the Trigalux T-Diver is better than the Seiko SKX007 in almost every regard. Firstly, the T-Diver utilizes sapphire crystal with AR coating, while the SKX007 uses Seiko’s proprietary Hardlex crystal, which is much more perceptible to scratches as compared to sapphire. Secondly, the T-Diver uses the Seiko NH35A movement, which is hacking and hand-winding – unlike the 7S26 movement found in the SKX007. Lastly, the lume on the T-Diver (be it Swiss C3 or Trigalux’s X5) is stronger and longer lasting than the lume on the SKX007. As such, the T-Diver definitely has the better build quality. Design wise, it becomes subjective. Personally, I prefer the design language of the T-Diver, as I find it (the dial colour, the indices, the retro design) more unique and interesting. However, there are bound to be people who prefers the timeless, iconic look of the SKX007. Unfortunately, I’m not in that boat – I find the design of Seiko’s lower-priced divers uninteresting and generic. As such, I’m drawn to dive watches with dial designs that set themselves apart from the masses – and I believe the T-Diver to have just done enough to achieve that! The Seiko SKX007 can be had for $271 SGD from Skywatches’ web-store, while the Trigalux T-Diver (C3 version, after promo code and excluding VAT) would cost you just $299 SGD. Given that both watches are priced very similarly, I’ll have to give the win to the T-Diver as it possesses a far better build quality as compared to the SKX007. Furthermore, I find the design of the T-Diver more interesting than its Seiko’s counterpart. As such, the Trigalux T-Diver is my winner in this shootout! Conclusion: so the Trigalux T-Diver “shiok” or not? Definitely. For a hair under $300 SGD, the Trigalux T-Diver packs a lot of value. It ticks a lot of boxes for a diver – sapphire crystal, a decent WR rating, strong lume, a workhorse movement, and tops it off with an interesting, retro-inspired design. I’m aware that not many in the watch community – even those who closely follow the microbrand scene – have heard of Trigalux. It’s a shame that the T-Diver has largely flown under the radar, because the value proposition of the T-Diver is really superb. I’ve reviewed a couple of affordable dive watches to date, and I’ll say this: I believe the T-Diver to be the best dive watch you can have for under $300 SGD. 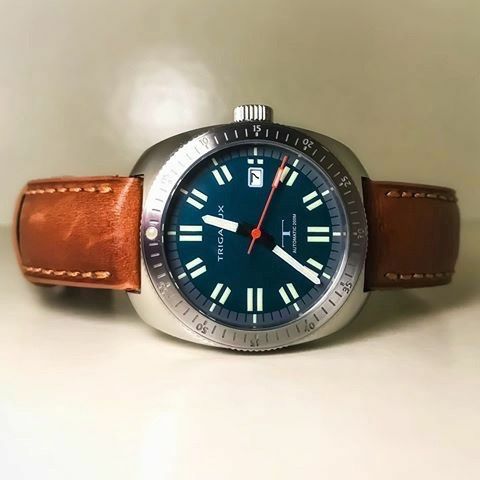 For those interested in getting this bang-for-buck diver, the promo code “WAHSOSHIOK” entitles you to 10% off on Trigalux’s web-store! After the promo code, the C3 variant of the T-Diver can be had for just ~190 Euros/ $299 SGD (excluding VAT), while the X5 variant of the T-Diver would set you back ~226 Euros/ $355 SGD (excluding VAT). I think that’s great value for this watch – this is a buy I will not hesitate to recommend in a heartbeat. View Trigalux’s full collection here. NH35a automatic movement 21600 bph, hand-wound with second hand stop and 41-hour power reserve. hello, based on your review I ordered my T-diver. One question : if I consider to change the bezel (i find it too thin to operate) , what would you advise ? for 42mm case diameter , did you you a place where I can buy bezel ? you have deeper overview for the watch market in general i think. Unfortunately, I really have no idea. However, I have heard of some buying their bezels off eBay.